This faux leather jacket can be worn as a tunic and is customisable for your character's costume with a removable faux fur mantle, Can be fastened across your chest as padding for armour or left open as a dynamic jacket. An ideal layer to any character's costume. 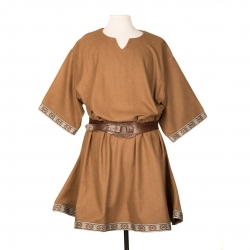 This is a Luxurious, versatile tunic in a distinctive earth tone pattern with layered suede effect sleeves. Unique woven brading and wooden horn shaped toggles. Striking on its own and comfortable to wear with armour and other layers. It would look sensational in any Historical or Fantasy setting. Ideal base kit for any LARP of Cosplay. Size: Length 38"Inches Chest 56" Inches Shoulder up to 36"Inches Sleeve 18"Inches. This is a Luxurious, versatile tunic in a distinctive pattern with layered suede effect sleeves. Unique woven brading and wooden horn shaped toggles. Striking on its own and comfortable to wear with armour and other layers. It would look sensational in any Historical or Fantasy setting. Ideal base kit for any LARP of Cosplay. 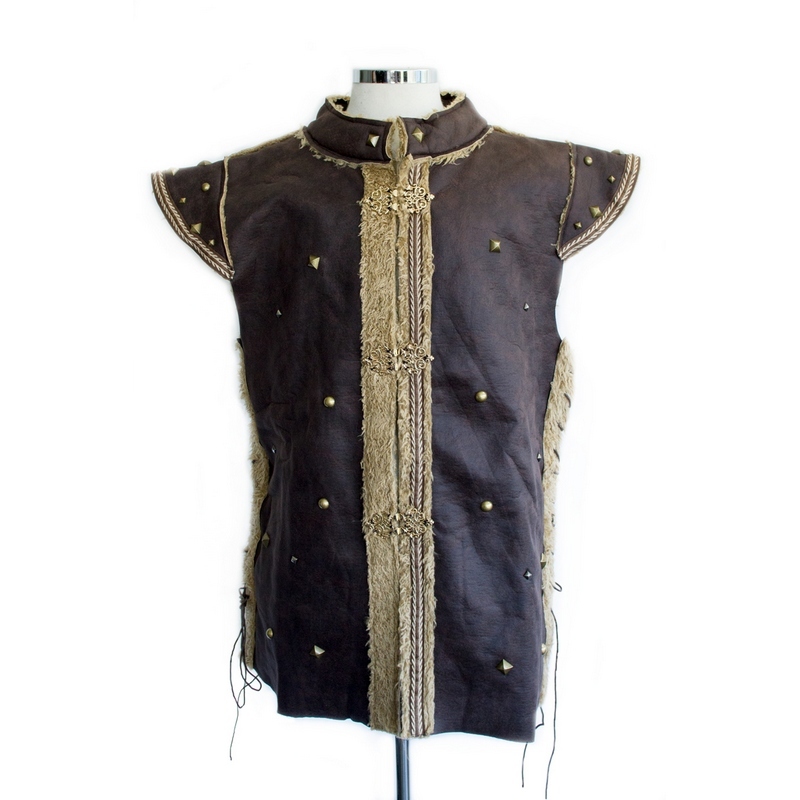 This tunic with quilted faux leather padding fastens with horn shaped wooden toggles, ideal padding for any armour while still looking striking and battle ready on its own. Fastening by the padded arm for personal adjustment. This light weight gambeson is comfortable while still providing plenty of padding all around for any armour atop it or worn on its own. laced at the chest and wrists for your adjustment. Size: Length 39 Inches Chest 50 Inches Shoulder up to 42 Inches Sleeve 24 Inches. This is a Luxurious, warm and versatile tunic in a distinctive mottled green and black wool mixture, with a slight flare towards the hem. Edged with a soft faux fur trim in complementary black and a striking decorative trim in shades of green. Striking on its own and comfortable to wear with armour and other layers. It would look sensational in any Historical or Fantasy setting. This is a Luxurious, warm and versatile tunic in a distinctive mottled purple and black wool mixture, with a slight flare towards the hem. Edged with a soft faux fur trim in complementary black and a striking decorative trim in shades of purple and gold. Striking on its own and comfortable to wear with armour and other layers. It would look sensational in any Historical or Fantasy setting. This is a Luxurious, warm and versatile tunic in a distinctive mottled grey and black wool mixture, with a slight flare towards the hem. Edged with a soft faux fur trim in complementary black and a striking decorative trim in shades of brown and dark brown. Striking on its own and comfortable to wear with armour and other layers. It would look sensational in any Historical or Fantasy setting. 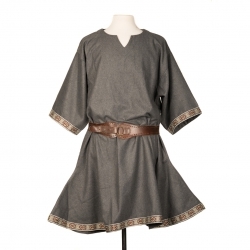 A mid-weight woollen-mix tunic with unusual detachable sleeves. Features a toggle closure, coordinating trim and lacing at the elbows. Very wearable year-round, in all weathers.